Something for everyone on our seasonal menu. 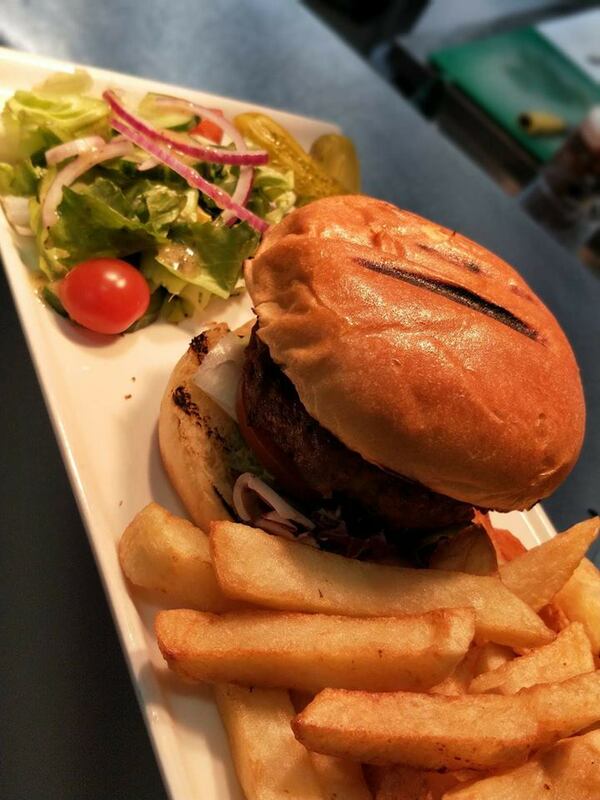 We use only the best ingredients sourced from award winning local suppliers. All chicken on our menu is free range and, along with the rest of the meat, sourced from high quality local butcher Geoff Hughes. All fruits and vegetables are sourced from local greengrocer Perry’s Produce. We add seasonal specials to our menu throughout the year so keep an eye out in the bar for our new additions! Food is served from 12pm-9pm (Monday – Saturday), and 12pm-7pm Sunday, with home-cooked roasts also available (booking advised), please see below for full menu and further details. To book a table please pop in or contact us. Dressed in a saefood sauce on a bed of baby gem lettuce. served with toasted bread, picalilli, gherkins and a dressed side salad. Floured and seasoned, served with a lime and chilli mayo and Rocket. Ham Hock, Gherkins, a wedge of Cheddar Cheese, Toasted Baguette, Celery Sticks and pots of Pickle and Onion Marmalade. served with rice or chips and topped with samphire. cooked to your liking, with horseradish mash, samphire and baby carrots tossed in butter and garlic. cooked to your liking. served with your choice of chips or leek mash with a side of seasonal vegetables and a red wine jus. With smashed potatoes and rosemary. Served with buttered vegetables, apple cider jus and a shard of pork crackling. Steamed in a white Cream and Parsley Sauce. Chicken breast pieces in a tarragon infused white sauce with roasted peppers, peas and topped with cheese and breadcrumbs baked in the oven. Red onion, Roasted peppers, long stem broccoli and courgettes tossed in a pomodoro sauce. Served with Grilled Tomato, Flat Mushroom, salad and chips. peppered sirloin steak, mixed leaf salad, mustard mayo dressing and crispy tortillas.